Picking up from where we last left our Martians, we just have a little bit left to do. I also wanted to cover some of the special options that you'll have to paint when working on a unit of ten (including the commander, grunt carrying the Freeze Ray, and the knife wielding grunts). Where we left the Martians at the end of the previous tutorial. Many people like to go for gritty, dirty looking figures. I know I usually prefer that aesthetic in wargaming figures. However I think the style and presentation of the Mars Attacks! franchise in the comics, cards, and film lends itself to a colourful, cartoony look. For this reason, I've chosen to add highlights to the Martians at this point. If you'd prefer a darker and grittier look, I would advise skipping this stage and instead apply weathering pigments to match your bases (for the base scheme I used, I would advise using Secret Weapon Miniature's Ash Grey pigment). For those who like the cartoon style, I used a 1:1 mix of Citadel's White Scar and Vallejo Game Air Electric Blue applied in a careful edge highlight on the uniform. I tried to make sure I only applied the highlight to the upper edge of each armour segment (see the picture below). You'll want to be sparing with your highlights as excessive highlighting can look very bad very quickly, and be a very frustrating setback. Notice on the legs how I highlighted the upper edges of the armour segments. You'll want to make sure you have a nice and thin detail brush going into the next stage. I applied Khorne Red to the lenses on the Martians' collars and well as their weapon sights. I then applied a tiny dab of Evil Sunz Scarlet in the lower corner of the lenses and another tiny dab of White Scar on the opposite corner. This method is an extremely simplified version of the lens technique I'll likely go into more depth with when we look at the Martian Robot or Saucer in future articles. If you're not comfortable working with this level of detail or you're having trouble with it, I would recommend replacing the Khorne Red with Evil Sunz Scarlet and leaving the lenses like that. A Martian Commander displaying the technique for lenses. I chose to leave his gloves and boots green, but I will cover how I would go about painting them yellow. While painting the Freeze Ray, I painted the main body of the weapon with the same grey colour scheme I used in Part I for the Disintegration Rifles, but I was careful to leave the details along the top as well as the muzzle of the weapon the blue colour that I basecoated the figure with. Then, I highlighted two opposite quarters of the muzzle (see the picture below) with a 1:1 mix of the Vallejo Game Air Electric Blue and Citadel White Scar. Then I added more White Scar, bringing the mix up to a 2:1 and highlighted the same areas, being careful to leave some of the first highlight showing. After that I applied a very thin highlight of pure White Scar, again being careful to leave the previous highlights showing. I used the same technique and colour mixes to highlight the other details along the top of the Freeze Ray. Is it just me or did it suddenly get cold in here? I didn't want my Martians to have normal looking combat knives, I preferred the idea that they used a strange, alien material for the blades. I basecoated the knives with Vallejo's Scurf Green from their Game Color Range. I then made a 1:1 mix of Scurf Green and Vallejo's Falcon Turquoise and applied a heavy highlight to most of the blade, but still leaving some of the basecoat visible. I then highlighted the edges of the blade with pure Falcon Turquoise, and then again with a 1:1 mix of Falcon Turquoise and White Scar. Finally, I touched up the most pointed areas with a thin highlight of White Scar. If you want more contrast on the blade, you could apply a bit of Nuln Oil however I chose to leave the knives as they were. I really didn't like the models that had yellow boots and gloves that were on the box. I couldn't see them as anything but cleaning gloves and rubber boots, and they made the figure look out of place among the other Martians. Since the Commander has a distinct pose and a pistol, I decided to paint his gloves and boots like the other Martians as he already stood out enough. If you do still want to paint yours with yellow, I would advise basecoating the boots and gloves with two or three very thinned out coats of Vallejo's Sun Yellow from their Game Color line. Once your basecoat has dried, I would then apply Citadel's Riekland Fleshshade wash to the yellow areas followed by a highlight of Vallejo's Moon Yellow. Finally I would highlight the most raised areas of the boots and gloves with a 1:1 mix of White Scar and Moon Yellow. The helmets have been a popular area of discussion since the release of Mars Attacks! as many people are wondering the best way to fasten them to the miniatures while others debate cutting down the helmet in size. I would not recommend cutting your helmets, largely due to the fact that when securing them the lip on the rear of the helmet will be your main point of contact and will give it a stronger bond to the miniature. Simply enough, I used Vallejo Gloss Acrylic Varnish to fasten the helmets as it's stronger than Elmer's Glue but won't fog the helmets like superglue will. Be very careful when attaching the helmets to ensure they're level and properly seated on the figure, as they look very bad when crooked. Note the lip of the helmet on the backpack. 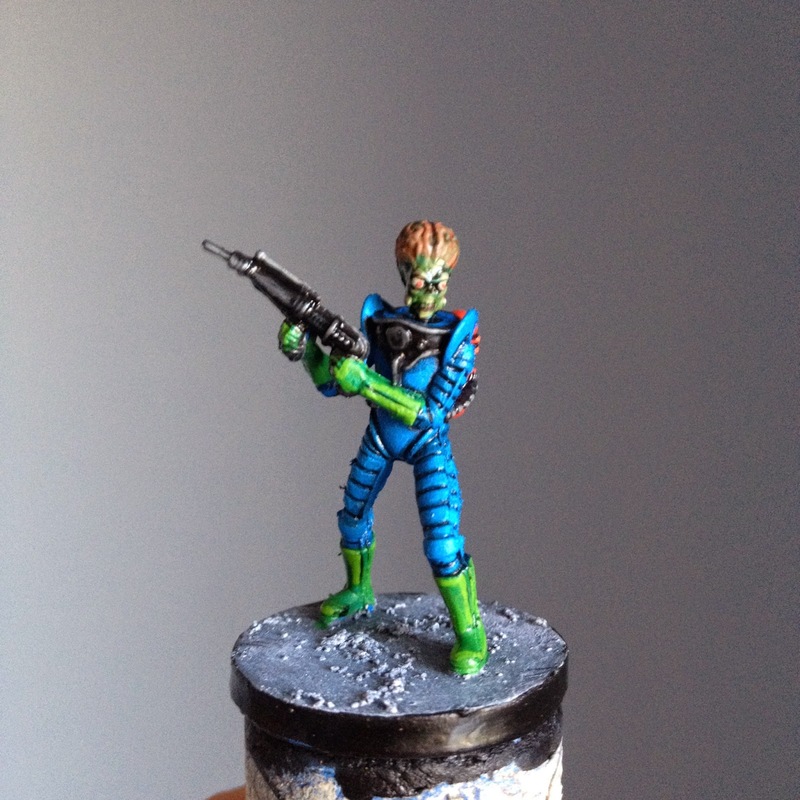 A completed Martian deathsquad ready for the tabletop. A side-by-side comparison of Martians with and without their helmets, in case you're considering leaving them off. Tune in next weekend for the Mars Attacks! US Troopers painting tutorial!